building or planting right, which is a right to have buildings, works or plants totally or partly on, above or under someone else's land; a building right is granted for a maximum of 50 years. The second are rights in personam: claims allowing the request of a certain performance from another party (leases). Apart from these, there are a number of accessory real rights such as mortgages and pledges. Ownership can also take the form of commonhold (condominium ownership or co-ownership). Ownership and property is evidenced in the Mortgage Register, in which all transfers of property – rights in rem, including mortgage deeds and easements (with the exception of the legal easements), as well as leasehold interests with a duration of more than nine years, must be described to be effective against third parties. Land and buildings are also described in the Land Register for other purposes (the Land Register is used for the calculation of real estate withholding tax). Belgian property law is essentially contained in the Belgian Civil Code. This Code also contains specific rules dealing with, inter alia, retail leases, residential leases and farm leases. Specific legislation exists for long leases, surface rights and mortgages. Interpretation of the Belgian Civil Code by the courts – especially the Supreme Court – plays an important role. Planning and environmental regulations are governed by Flemish, Walloon or Brussels regional legislation. According to the National Bank of Belgium, the GDP growth rate for Belgium slowed down slightly in 2018, reaching 1.5 per cent (compared to 1.7 per cent in 2017), and is expected to maintain more or less the same pace over the following two years (1.4 per cent in 2019 and 1.3 per cent in 2020). Given the favourable economic climate, the real estate sector continued to boom in 2018 and this in all segments. Due to an excellent final quarter and several important end-of-year transactions, the total investment volume reached €5.24 billion, an absolute record. The only previous year in which investment volume reached €5 billion was in 2007, the year preceding the financial crisis. For the office property market 2018 was a good year, with an overall take-up of 762,793 m2, of which 414,927 m2 is in Brussels. In addition, vacancies decreased further to a 15-year low of 8 per cent in Q3 in Brussels. However, it is expected that this vacancy rate will increase again as from 2019. Some other remarkable trends: large-size deals were once again very present on the market, with seven deals representing 43 per cent of the investment volume. As to the profile of the stakeholders, except for high street and suburban retail, Belgians are the sellers (80 per cent) and foreign investors the purchasers (53 per cent). As for the co-working trend, this frenzy continues in 2018 with the demand for co-working operators in the first semester of 2018 nearly equalling the full year 2017. Regional markets continue their popularity streak, with Leuven, Liège and Namur confirming their status as newcomers in the regional market, next to the traditional key regional markets Antwerp and Ghent. There are generally no legal restrictions on ownership or occupation by foreign entities. Neither are there, in principle, any restrictions on obtaining loans from either Belgian or foreign banks, it being understood that the source country of finance is important from a tax point of view (as the tax treaty, if any, may determine to what extent withholding tax is charged on interest payments). As regards security rights, no restrictions exist except for the general pledge over the business, which can only be in favour of an EU-licensed credit institution. In this respect, 2018 has brought some new developments with the entry into force on 1 January 2018 of the new legislation regarding securities on movable property. Among other things, this new legislation removes the restriction that the general pledge over the business can only be granted in favour of an EU-licensed credit institution. A very common structure to invest in real property is a direct purchase (asset deal). Many transactions, however, are conducted through company acquisition (share deal) because of, among others, tax considerations. Split sale was another commonly used structure in real estate transactions prior to the introduction of the anti-abuse tax provision introduced in Belgium by the Law of 29 March 2012. A share deal (sale of shares of a company owning real estate) remains a common way to structure the investment. As a rule, except in cases of simulation (for instance, if the property is contributed to a new company after agreement has been reached on the object of the sale), no registration tax is due on the sale of shares. A share deal may produce a substantial saving on transfer tax for the purchaser, as the transfer tax due in the case of an asset deal is usually borne by the purchaser. From a direct tax point of view, a transferred company continues to depreciate the real estate during the remaining depreciation period on the remaining depreciation basis because the property is not considered to have changed hands. A taxable capital gain is usually realised when the real estate is subsequently sold. The capital gain is equal to the difference between the sale price and the tax value of the real estate on the company's books, meaning the historical cost less depreciation (the sale price is usually higher than the tax value of the real estate on the books); hence, the parties usually take into account the tax latency for the valuation of the shares. The burden of said tax latency is usually shared between seller and buyer. Corporate income tax is levied in Belgium at a rate of 29.58 per cent for the tax years 2019 and 2020, and 25 per cent as from tax year 2021. The tax on capital gains on fixed assets held for at least five years can be deferred subject to reinvestment of the full proceeds of the sale price in depreciable assets. The tax is then recovered over the duration of the new depreciation. As of 2018, the use of certain tax assets, such as tax losses carried forward, is limited for any taxable year to €1 million plus 70 per cent of the taxable income above €1 million, leading to a 'minimum' taxation of the remaining 30 per cent. In any case, tax losses can be carried forward indefinitely; however, tax losses are barred in the case of a change of control that is not justified by legitimate financial or economic needs. An advance ruling can be applied for with respect to the existence of legitimate financial or economic needs. The ruling commission, however, often considers that a change of control of a real estate company is not justified by legitimate financial or economic needs; hence, carried-forward tax losses are generally not taken into account for the calculation of the sale price of the shares. As stated above, split sales structures are no longer an option for many investors; however, the granting of a 99-year emphyteotic right (long-term lease) can still be considered and is subject to a transfer tax of 2 per cent. Each region has enacted its own town and country planning code. In the Walloon Region, the Walloon Code of planning and zoning, urban development, heritage and energy has recently been replaced by the Walloon Territorial and Development Code. The Walloon Territorial and Development Code entered into force on 1 June 2017. In the Brussels Metropolitan Region, the Brussels Code of planning and zoning applies. A substantial reform of this code has been adopted. Part of the provisions entered into force on 30 April 2018. The most important part of the provisions will enter into force on 20 April 2019. In the Flemish Region, planning and zoning regulations are governed by the Flemish Code of Planning and Zoning and a Flemish Decree on the Unique Surroundings Permit. This decree provides that both the building and environmental aspects are addressed in one single permit that is granted by one single authority. Since 1 August 2018, the socio-economic permit and the environmental permit have been integrated in the 'unique surroundings permit'. In all three regions, every property falls within a particular zoning area, determined by the applicable zoning plans (regional zoning plans and municipal zoning plans). These plans must be taken into account whenever the competent authorities are dealing with an application for a building permit, but also when issuing any other permit. Non-compliance with the applicable provisions of the zoning plan or permit requirements can trigger a variety of administrative, civil and criminal sanctions, depending on the date of the execution of the works at hand. On 1 January 2018, a new Flemish Decree on the Integrated Retail Policy came into force. It allows Flemish municipalities to determine central retail areas with limited retail possibilities. In the Walloon Region, socio-economic permits are issued by the municipalities or the Region, depending on various criteria, such as retail surface area. The Decree on Retail Premises also introduced an integrated permit that provides that all building, environmental and commercial aspects need to be addressed in this integrated permit. in principle, the author of the contamination will be held liable for the pollution. However, the obligation to carry out a soil survey, and, if necessary, to remediate the soil, will rest upon the owner, user or operator of the site, unless they are exempted. If they have not caused the pollution, then they can later recover their costs from the author of the pollution. Breaches of said regulations can also give rise to criminal sanctions. The sale of real estate is subject to transfer tax at a rate of 12.5 per cent (if the property is located in the Walloon or Brussels Metropolitan regions) or 10 per cent (if the property is located in the Flemish region). The transfer tax is calculated on the purchase price, which may include the charges imposed on the purchaser. However, if the fair market value is higher than the purchase price, the transfer tax will be calculated on the fair market value. Seller and purchaser are jointly liable to pay the transfer tax. The sale of a new building may be subject to VAT at a rate of 21 per cent, in which case no transfer tax is due. If the seller is a professional builder, the new building is automatically sold with VAT. Any other seller wishing to sell a new building with VAT must opt to do so; this tax is due on the purchase price of the new building. Transfer tax exemptions may be available if real estate is transferred within the framework of a transfer of an undertaking or within the framework of a reorganisation. A standard security package required by third-party lenders generally consists of a mortgage or an irrevocable mortgage mandate. In large transactions, the lender would also take security over other assets, such as a pledge over the receivables (rental income) or a business pledge (similar to a floating charge in the United Kingdom). In this regard, the Law of 11 July 2013 (which entered into force on 1 January 2018) intends to allow pledges over movables without the formal requisite of dispossession, but by means of registration in the pledge register. A mortgage deed must be signed before a notary public, the cost of which amounts to approximately 1.4 per cent of the mortgage amount. Therefore, borrowers will try to have the mortgage granted for an amount less than the value of the loan, and then grant a proxy to mortgage – by which the debtor irrevocably authorises the lender to establish a mortgage – in addition to the mortgage. Proxies to mortgage minimise costs but increase the risks for the lender. In addition, certain lenders take in rem security rights over the entire business of the debtors by way of pledges. A business pledge must be registered at the Land Registry, and an amount of 0.5 per cent of the amount for which the inscription is taken is due. Common lease agreements are subject to the general provisions of the Civil Code, which apply by default insofar as specific legislation has not deviated from them.2 The other types of lease agreements are governed by specific legislation in the Civil Code, for instance the Retail Lease Act and the regional decrees regarding retail lease of short duration (see Section VII.i, below), of which most provisions are mandatory. We will briefly review some of the general rules of the Civil Code and, when useful, make reference to or comparison with the Retail Lease Act. Parties are free to agree on the term of leases. Written lease agreements concluded for a fixed term end automatically when the lease periods have expired, without prior notice (except as provided otherwise in the lease).3 Leases may also provide early break options for one or both parties. In the framework of the Retail Lease Act, a mandatory minimum term of nine years applies (although a recent amendment of the Retail Lease Act (see Section VII.i, below) has also made retail leases of one year possible in the Flemish and Walloon Region); however, the tenant may terminate such a retail lease at the end of each three-year period, provided six months' prior notice is given. If the retail lease agreement explicitly allows so, the landlord may also terminate the lease at the end of each three-year period, if he or she wishes to carry on his or her own businesses in the leased premises, subject to a prior notice of at least one year. Parties may also terminate retail leases at any time upon mutual agreement, but such agreements must be notarised or declared before a justice of the peace. The amount of the rent is determined freely by the parties, by mutual agreement. If the rent does not provide an indexation clause, it will remain unchanged throughout the duration of the lease. However, parties may explicitly stipulate that the rent will be linked to the cost of living (which is most common) or any other parameters and will be revised accordingly (upwards or downwards). The Retail Lease Act stipulates the possibility for each party to request a revision of the rent at the end of each three-year period, provided the applicant can prove that the normal rental value of the premises has become at least 15 per cent higher or lower than the then applicable rent, because of new circumstances (the improvement of the district, etc.). The parties are free to provide a renewal right in favour of tenants. In the absence of such provision, there is no automatic right of renewal. Landlords may also claim higher rents offered by third parties; however, if current tenants match these offers, they are preferred. If renewal is refused as described in item (d), tenants can claim compensation for disruption of their business tenancies in some cases and under certain conditions. Landlords have an absolute right to refuse renewal without motive, but if they refuse to do so without invoking a motive provided for under the law, they are liable towards tenants for damages in an amount of at least three years' rent. Following the sixth state reform, the competence regarding residential and retail lease was (partially) assigned from the federal level to the regions (Flanders, Wallonia, Brussels Capital). The Flemish Region was the first to make use of its new competence and modified the Retail Lease Act in 2016 by adopting the Flemish decree regarding the retail lease of a short duration, more commonly known as the decree relating to pop-up stores. This decree, making it possible to enter into short-term retail leases for a duration of a maximum of one year (instead of the mandatory nine years provided in the Retail Lease Act) entered into force on 1 September 2016. The Brussels Capital Region has also grasped this competence shift by adopting the Ordinance of 27 July 2017 relating to residential lease. This Ordonnance entered into force on 1 January 2018. The novel approach of this Ordonnance is that the provisions relating to residential leases will be applied to all lease agreements for residential purposes: not only leases intended for main residence, but also leases regarding student residences and second residences will be subject to these provisions, save a few exceptions. In addition, to address the omnipresent phenomenon of co-housing, this Ordonnance introduces the 'co-housing pact': co-housers will have the possibility to sign a co-housing pact between them, determining the responsibilities of each resident and the modalities when a co-houser leaves the residence. The pact will be attached to the lease agreement with the landlord. Finally, this Ordonnance provides for the development of several useful instruments for tenants: a template lease agreement and inventory of fixtures, a list dividing the obligations (for example, regarding repair and maintenance of the leased premises) between landlord and tenant and an indicative table with rental prices per location. As predicted, these two items of regional legislation were the prelude of a larger wave of regionalisation: in the Flemish Region, the Residential Lease Act entered into force on 1 January 2019. It applies for lease agreements entered into after 1 January 2019. For lease agreements predating the entry into force, the federal law continues to apply. Notable novelties, which have rendered the typically tenant-friendly legislation more in favour of the landlord, are that the lease guarantee amounts to three months (instead of two months under the previous regime) and that the landlord can modify the rent in certain circumstances (for example if the new circumstances have increased the rental value by at least 20 per cent). The Walloon Region has followed the Flemish example and has adopted legislation regarding retail leases of a short duration, which entered into force of 1 May 2018. Likewise, the government of the Brussels Capital Region has also adopted draft legislation on the subject, but it has not yet been approved in the Brussels parliament. The Walloon Region adopted a decree relating to residential lease, which has entered into force on 1 September 2018. To conclude: regarding the residential lease, each region has adopted its own legislation meaning that, taking into account the federal regime, which still applies in some cases, there are currently four regimes for residential leases. Regarding the retail lease of short duration, only the Brussels Capital Region is still to adopt legislation in this respect, but this is in the pipeline. As regards retail leases (of normal duration), the regions seem a bit more hesitant: draft legislation has circulated but has not yet been adopted. Until recently, the split-sale structure was a much used and very popular structure in Belgium for transferring control over immovable property. A split sale involves the vesting of a long-term lease right (against payment of a lump-sum price) to the benefit of one party and the transfer of the ownership encumbered with the long lease to another – possibly related – party. The transfer tax due in connection with a long-term lease equals only 2 per cent of the amount paid under the long-term lease (compared with a transfer tax in the event of a transfer of the encumbered ownership amounting to 10 or 12.5 per cent, depending on the location of the property). The Act of 29 March 2012 introduced a general anti-abuse provision into Belgian tax law, which provides that a legal deed (or series of legal deeds) is not binding on the tax authorities if they can demonstrate that tax abuse has been committed. The Belgian ruling commission6 no longer issues advance rulings on split sales involving related parties. However, the Belgian ruling commission agrees to issue advance rulings on the termination of split sales carried out under the previous anti-abuse provision. Indeed, the Belgian ruling commission issued numerous rulings on the tax treatment of the reconstitution of the full ownership where the application of a transfer tax of 2 per cent, in respect of the acquisition of the long-term lease, and a transfer tax of 10 per cent or 12.5 per cent (depending on where the property is located), in respect of the acquisition of the encumbered ownership is confirmed. Such an advanced tax ruling on the ownership reconstitution will, however, only be issued on the condition that the buyer is not affiliated to the sellers of the long-term lease right and the encumbered ownership. With regard to split-sales, the Flemish tax authority (Vlabel) has issued stringent viewpoints regarding the reconstitution. According to these viewpoints, the reconstitution of the full ownership (even in the hands of a third party) will, in any case, trigger a 10 per cent transfer tax on the whole property. These standpoints are not in line with the stance taken by the Belgian ruling commission. However, for split sales that were put in place before 1 January 2015 and that were covered by a ruling issued by the Belgian ruling commission, the Vlabel accepts to reconsider its aforementioned viewpoint and to examine, in consultation with the ruling commission, which tax treatment should apply to the ownership reconstitution. Traditionally, the leasing of immovable property is exempt from VAT in Belgium. There are some exceptions to this rule (for example for the letting of parking spaces, warehouses, hotel rooms, or certain financial leasing agreements). The act of 14 October 2018 has introduced the possibility for the landlord and the tenant to jointly opt to subject their lease to VAT. The new rules entered into force on 1 January 2019. This is a revolution for the real estate sector in Belgium. Henceforth, the application of VAT will allow the landlord to deduct the VAT charged on the construction costs or on the acquisition price of his or her building, while remaining neutral for the tenant if he or she is in a position to deduct VAT. The new optional VAT regime on the letting of real estate is, however, subject to certain conditions being met: (1) the new regime will only benefit new buildings: that is, newly built buildings or fully renovated buildings for which the VAT on the construction costs was due at the earliest on 1 October 2018 (this allows the new measure to be implemented gradually); (2) the tenant must be a taxable person for VAT purposes and use the building exclusively within the framework of his or her economic activity (this can be either a VAT taxable or a VAT exempt activity); and (3) the option to tax must be exercised jointly by the landlord and the tenant. If the option for VAT is exercised, a special VAT revision period of 25 years will apply, instead of the usual 15-year period. Next to the option to tax, the act of 14 October 2018 also introduces a mandatory VAT regime for short-term leases (i.e., lease with a duration of maximum six months). The mandatory VAT regime will mostly apply in a business-to-business context and will not apply to the leasing of residential properties. Alongside the Belgian real estate funds regime, the Act of 12 May 2014 on Regulated Real Estate Companies and its implementing Royal Decree of 13 July 2014 created the regulated real estate company (SIR/GVV). This specific 'real estate' company is not caught by the AIFMD regulations. A SIR/GVV can only carry out the activities specified by the law (put real estate assets at the disposal of users, own real estate assets, enter into design–build–finance and similar agreements with public authorities and exercise certain activities in the energy sector and the waste sector) and must carry out its operational activities itself. the SIR/GVV must hold more than 25 per cent of the shares of any real company in which it invests. From a tax point of view, the SIR/GVV is liable to corporate income tax at a rate of 29.58 per cent for tax years 2019 and 2020 and at a rate of 25 per cent as from tax year 2021, although only on a very limited tax base. Capital gains and recurrent income from property, therefore, are not subject to tax. Public real estate companies opting for SIR/GVV status are subject to an exit tax amounting to 12.5 per cent of the unrealised capital gains on their assets and untaxed reserves for tax years 2019 and 2020 and a rate of 15 per cent as from tax year 2021. From a Belgian perspective, the SIR/GVV benefits from the provisions of double taxation treaties because it is subject to Belgian corporate income tax. As of 1 January 2017, dividends distributed by a SIR/GVV are subject to a 30 per cent withholding tax except for the SIR/GVV of which the real estate portfolio is composed of at least 60 per cent of real estates located in the EEA and exclusively or mainly dedicated to care and housing units benefit from a 15 per cent withholding tax. The Belgian government has announced that investors in a SIR/GVV would benefit in the near future from all withholding tax exemptions foreseen by Belgian law (such as the exemption for dividends received by a European company that owns 10 per cent of the SIR/GVV, the exemption for dividends received by pension funds, etc.). If no exemptions apply, the withholding tax is the final tax for non-resident investors and resident individual investors. However, non-resident investors can apply for reduced withholding tax under an applicable tax treaty. For resident corporate investors, dividends distributed by a SIR/GVV cannot benefit from the participation exemption and, as a rule, will be taxable at a rate of 29.58 per cent for tax years 2019 and 2020 and at a rate of 25 per cent as from 2021. Capital gains realised by resident corporate investors on shares in a SIR/GVV are fully taxable; capital losses are not tax deductible. To meet the needs of professional and institutional investors looking for real estate investments with a limited term, and in contrast to the SIR/GVV, which remains long-term oriented, a new type of fund has been created by the Royal Decree of 9 November 2016: the Specialised Real Estate Investment Fund (FIIS/GVBF). The FIIS/GVBF is dedicated to institutional and professional investors and large corporate actors and aimed at facilitating real estate investments in Belgium and abroad. The FIIS/GVBF status is available to institutional closed-end investment companies (but not to contractual funds) subject to AIFMD provisions, subject to certain exemptions (e.g., entities held by a single investor or entities exempted from AIFMD provisions as referred to in Article 2.3 of the AIFMD are allowed to opt for the FIIS/GVBF status). The FIIS/GVBF status requires a mere registration with the Federal Public Finance Service and is granted for a maximum duration of 10 years, with the option to extend for further five-year periods. The FIIS/GVBF can invest in various types of real estate assets, save for limited restrictions (e.g., requirement that the properties located in Belgium be directly held by the FIIS/GVBF, minimum value of real estate assets of €10 million, interdiction to act as real estate developer). The FIIS/GVBF is not subject to certain regulatory restrictions applying to SIR/GVV (e.g., no requirement with respect to debt ratio or to diversification, which implies that the FIIS/GVBF may hold a single real estate, but at least 80 per cent of its net profits must be distributed). From a tax point of view, the regime governing the FIIS/GVBF aims at being particularly attractive: opting for the FIIS/GVBF status triggers the payment of an 'exit tax' of 16.995 per cent and the tax regime is for the remainder identical to that applying to SIR/GVVs. As of 21 December 2018, 35 FIIS/GVBF were registered in Belgium, which is 20 more than at the same time in 2017. 2018 turned out to be an excellent year for the real estate sector in Belgium. Legislation regarding real estate, which up until recently seemed to be immune to change, has known further regionalisation. In addition, following the public consultation of December 2017, a detailed and comprehensive draft of real estate legislation was submitted to the federal parliament in 2018. The proposal constitutes a far-reaching reform of legislation that has remained largely unchanged since the nineteenth century. The proposal is aimed at rendering the rights in rem more apt for large-scale modern transactions, while at the same time leaving a large amount of flexibility for the parties. Given the fact that, due to a political crisis in December 2018, the current government no longer has a majority in the parliament, it is uncertain whether the draft will be adopted before the next federal elections of May 2019, after which a new government will be formed. 1 Yves Delacroix and Alexandre Emond are partners at Liedekerke Wolters Waelbroeck Kirkpatrick. 2 Sections 1714 to 1762 bis of the Civil Code. 3 Section 1737 of the Civil Code. 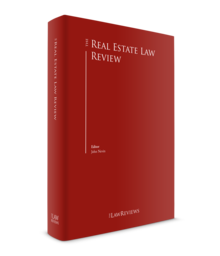 4 Section 13 of the Retail Lease Act. 5 For example, personal occupation of the premises by the landlord, non-commercial use of the premises, required reconstruction works in an amount higher than three years' rent (with the main cause being attributable to the tenant). 6 With regard to real estate transactions in Flanders, the Belgian ruling commission no longer has competence to issue rulings. A new regionalised ruling administration has been created. This is the consequence of the decentralisation of competence for tax from the federal level to the regions. Since 14 August 2015 (following the Decree of 17 July 2015) advance rulings can also be requested from the Flemish tax authority. The fifth edition of this book aims to continue to provide those involved in handling shipping disputes with an overview of the key issues relevant to multiple jurisdictions. We have again invited contributions on the law of leading maritime nations, including both major flag states and the countries in which most shipping companies are located. 2018 has been a transitional period for the international oil and gas industry. With the industry enduring a fourth straight year of low oil prices, and with no prospects for a significant increase in sight, participants in the industry have been forced to adapt. Oil companies must continue to be disciplined, allocating scarce capital only to their best prospects, and shelving less promising projects for future years. Some in the industry have already started to worry that by reducing capital expenditures the seeds of a future price shock are being sown. We are very pleased to present the fifth edition of The Public-Private Partnership Law Review. Notwithstanding the number of chapters in various publications in The Law Reviews series on topics involving public-private partnerships (PPPs) and private finance initiatives (in areas such as projects and construction, real estate, mergers, transfers of concessionaires’ corporate control, special purpose vehicles and government procurement), we identified the need for a deeper understanding of the specific issues related to this topic in different countries. The sixth edition of The Aviation Law Review marks the continuation of one of The Law Reviews’ most successful publications. In the year since the last review was published, there have been some significant developments with regard to international air carrier liability, with both Russia and Thailand acceding to the Montreal Convention on air carrier liability of 1999 alongside Chad, Indonesia, Mauritius, Sudan and Uganda. Inevitably, the European aviation legal scene continues to be dominated by Brexit where reassuring words, at least by regulators in the UK, have yet to be capped by any positive developments in terms of final agreements. Much of the mining sector continues to emerge from a lengthy down-cycle. The world economy continues to expand, albeit at a deliberate pace. This book gathers the views of leading mining practitioners from around the world. The first part of the book is divided into 18 chapters, each dealing with mining in a particular jurisdiction. These countries were selected because of the importance of mining to their economies and to ensure a broad geographical representation. Mining is global but the business of financing mining exploration, development and – to a lesser extent – production is concentrated in a few countries, Canada and the United Kingdom being dominant. As a result, the second part of the book has five chapters that focus on financing.